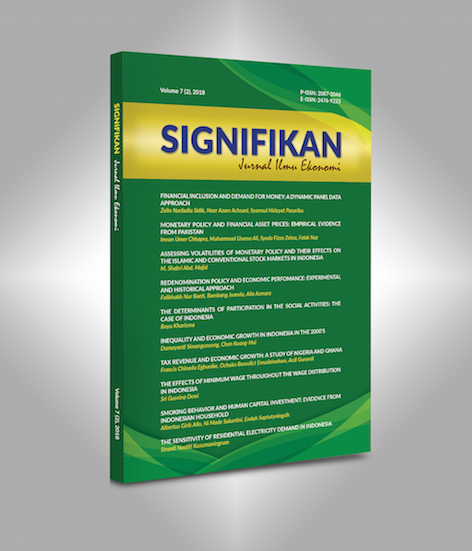 SIGNIFIKAN: Jurnal Ilmu Ekonomi (Journal of Economics) is an international journal published by Faculty of Economic and Business Universitas Islam Negeri Syarif Hidayatullah. This journal focused on Economics studies. The journal first published in 2012. The Journal published twice a year. The aim of the journal is to disseminate the research in Economics studies. Languages used in this journal Since 2016 is English. Signifikan: Jurnal Ilmu Ekonomi (Journal of Economics) accredited (recognized) by the Ministry of Research-Technology and Higher Education Republic of Indonesia No. 036a/E/KPT/2016 (May 23, 2016) Valid until May 2021. All articles in this issue (10 original research articles) were authored/co-authored by 29 authors from 6 countries (Indonesia, South Korea, Japan, Pakistan, Algeria, and Nigeria).